Home to many longstanding industry tradeshows and forward-thinking public educators, the State of Massachusetts is where some of Modeltech’s most popular fire safety simulators were born. Our first discussions took place in Massachusetts, where public educators were looking for a more interactive way of teaching about kitchen safety. After discussions during the MA Fire & Life Safety Annual Conference, we were invited as part of a focus group at the “Dept. of Fire Services” in Stow, MA in early 2010 by Jennifer Mieth – the well-known ‘Manager, Fire Data & Public Education Unit’ at that time . Jennifer confirmed to us later that Modeltech Int’l. remains the only exhibitor to have never missed an edition of the Conference since it started in 1995. An impressive record for a company from out-of-state! One year later, we were launching what are now recognized as the absolute best kitchen safety props on the market. These two full-size interactive modules have since spread rapidly from USA to CANADA and to foreign countries across the world. 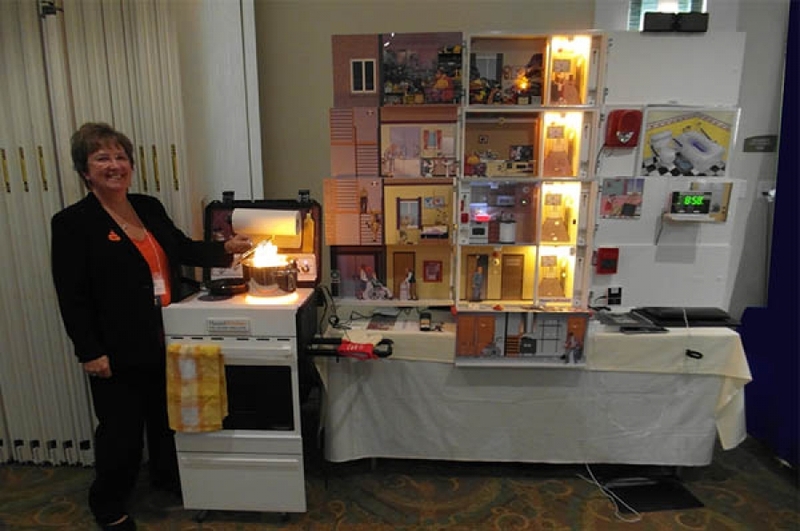 During the MA Fire & Life Safety Conference, Modeltech Int’l also introduced an all-new product, the Hazard Apartment for Seniors. This unit can be electronically connected to the Hazard Kitchen to help seniors focus on the most common source of fire in apartments: the kitchen. It was such a massive hit that the entire team of the Council on Aging from the Town of Burlington invited Modeltech to showcase both products during the annual conference of the MCOA (Massachusetts Association of Councils on Aging). Many thanks to Cinthya Ouellet, Public Education Coordinator at the ‘MA Dept. of Fire Services’ and her predecessor, Jennifer Mieth, who have encouraged us to develop these very effective new props.